Thanks to everyone who joined us in Lancaster for the North West Conference on Saturday. It was an excellent day out and great to meet fellow Lib Dems new and slightly-less-new. I hope next time around to meet those of you who were kept away by the combination of fierce weather and the rail strike. P.S. There's still time to buy tickets in the Lib Dem Christmas Draw - some fabulous prizes on offer and the proceeds help fund our work in the North West. The idea that the people of Britain should be given a say once they knew the terms for leaving the EU was dismissed when Liberal Democrats first demanded it writes former MEP Chris Davies. Not now. Now it's a very real possibility. We know that 52% of the electorate registered their protest in the June 2016 referendum. Maybe it was against the EU, or against immigration, or against the Tories, or against the bankers. What we don't know is what they voted FOR! Did the 52% really vote to make our country poorer? Did they vote to make the UK weaker? Did they intend to keep EU rules but deny Britain any role in making them? The Government will do its best to spin and fudge, but one way or another it looks as though this is what we are going to get, and I'm damn sure it's not what people want. Give the people a chance to stop this nonsense! With the Brexit negotiations in chaos this is the time for us to shout out. Join the People's Vote march in London this Saturday. It starts on Park Lane at 12.00. It'll be over in Parliament Square by 15.00. The TV will have its pictures and the newspapers will have their stories. It'll be bigger than anything the Brexiteers have ever done. Liberal Democrats will be marching together. Our contingent will be meeting at Wellington Arch, Hyde Park Corner, W1J 7JZ. Get to the march cheaply! A host of local cross-party campaign groups have organised coaches to help you get to the march, some of them subsidised. For example one for Manchester will pick up at Chorlton Street Coach Station, Didsbury and Hazel Grove. See below for booking details. In this case, you pay £30 and get £20 back. More info here. Another similar coach runs from Southport, picking people up in Ormskirk and St Helens. The eventbrite page for that is here. There is also one from Liverpool (details here) and another from Wirral (details here). Note none of these sets of coaches are organised by the Lib Dems and the details are the best we have at the time of writing - act quickly or coaches may be full! However if they are full it's worth expressing your interest in attending to the organisers as additional coaches may still be organised if there are enough people wanting to take part - so please don't leave it til the last minute! Often in politics we focus on Westminster - but local councils have a huge impact on people's daily lives. At Regional Conference in Lancaster we caught up with Claire Craven, who was elected to Preston City Council, Cadley Ward, in May this year, to chat about the difference being on the council makes. When did you join the Lib Dems? I first joined the party when I was at University in Glasgow which was a fantastic experience. I was even lucky enough to campaign alongside Charles Kennedy for his first term as University Rector in 2008. After university life got in the way and my membership lapsed although I remained a Lib Dem supporter (and voter!). My husband and I moved to Preston in 2015 and shortly after the move we watched the 2015 General Election in horror. I renewed my membership the day after the election and he joined for the first time as well. A couple of weeks later the then Chair of Preston & Wyre Lib Dem's emailed us to welcome us to the area, and to the party and invited us along to their next meeting. The rest is history! When did you start campaigning to win your ward? I've been campaigning in Preston since 2015 including plenty of canvassing sessions in Cadley. Cadley has been a Lib Dem council ward for decades thanks the to hard work of it's councillors including local Lib Dem legend, Honorary Alderman Alan Hackett. It was a huge honour to be asked to stand when Stephen announced that he was going to step down this May. I joined the campaign in earnest early this year but I've been actively campaigning in the area for much longer. Thanks to the hard work of the whole Preston & Wyre Lib Dem team I won in May, I can't thank them enough! Was there a big issue that swung it locally? One of the challenges we have in Preston is convincing voters who perhaps don't normally vote Lib Dem nationally to vote for us locally. We do this by working really, really hard every month of the year. By June, less than one month after the elections, we were already back out on the doors doing regular canvassing session. We take 'working for you all year round' very seriously. It's important to be visible and supportive of our communities and we've been a friendly, helpful presence at events like Preston Pride and local Fresher's fairs. So no, there isn't one big issue that swung it for us but a history of hard work paid off. What was the most challenging obstacle and how did you overcome it? The biggest challenge as a new councillor for me has been finding the balance between a very busy full time job and council duties. Things like case work, canvassing and leaflet deliveries have been part of my evenings and weekends for over 3 years now and I thoroughly enjoy them but suddenly you have to add council meetings, training sessions and civic events into the mix. It's all very enjoyable and I'm very fortunate in that I have a very understanding employer who allows me to alter my work schedule around my council obligations but I do need to be careful to plan my diary in advance! I would say to other candidates who work full time or have other busy obligations that it is absolutely possible to be a councillor and to work full time etc, but the support of your local party will go a long way towards making it practical and enjoyable. I'm eternally grateful to the rest of the Preston & Wyre Lib Dem team for helping me out when things get a bit hectic and I hope I manage to repay it in turn! What have you been doing as councillor? What's the difference been compared to being "just" a regular local campaigner? The biggest difference obviously is that you attend Council meetings and vote on matters that affect your local residents. I have proposed my first Motion to Council recently and it will be debated this Thursday (18th Oct). It's a matter I feel very passionately about and I do hope my colleagues at Council will vote to pass my motion proposing to respond to the governments consultation on Fracking applications by calling to keep decision making on Fracking local. Another huge difference is how much more enjoyable canvassing is when you get to say 'Hello! I'm Claire, one of your local city councillors...' I'm probably not supposed to admit this but for those of us who can be a little shy and nervous about canvassing, the little buzz you get from being able to introduce yourself as a councillor really helps. All the more incentive for all the prospective candidates out there to go out and win their seat! What would you say to anyone thinking of standing - whether for a "winnable" or "unwinnable" patch? Absolutely go for it and all the best of luck to you! The worst case scenario is you don't win this time, but you can take pride in having stood up for your beliefs while making some great friends along the way. Thanks to everyone who joined us for North West Conference in Lancaster last weekend. Despite the weather and the rail strike it was an excellent day out and we've had a lot of positive feedback about the switch to the new venue. 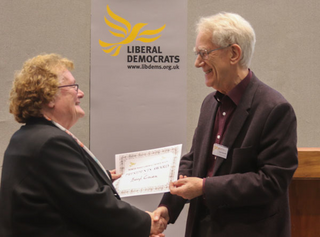 Videos from the conference are being added to our members' Facebook group and our Youtube and in the meanwhile some of the photos are up on the North West Lib Dems Flickr page. 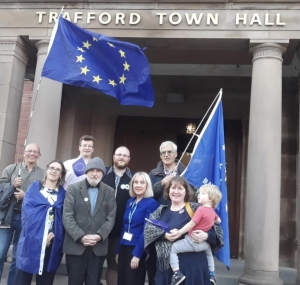 Trafford council gave its support to the People's Vote campaign for another EU referendum two weeks ago.Lib Dem councillor Jane Brophy won cross-party backing for her motion on a second vote over Brexit. Proposing the motion Jane said, "It is our job to promote a bright future for all our young people. 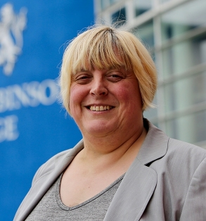 "Are councillors in this chamber comfortable sitting back, knowing that Brexit will cause a massive economic slowdown... just as those who were too young to vote in 2016 hit the job market, or start the final stages of their education?" There are just two Lib Dems out of 63 seats on the council but Jane got the backing of Labour, Green and one Tory councillor so the motion passed 33-30. Great work! We had three council byelections in the North West last week.In Warrington we saw our vote share drop - but so did every party that had stood the previous time around as a high profile local independent came from nowhere to win the seat in Penketh and Cuerdley. 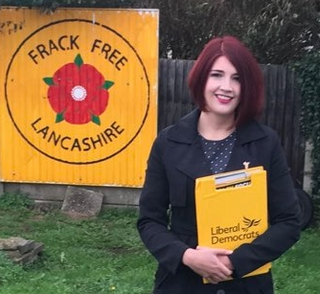 A third byelection in West Lancashire sadly had no Lib Dem candidate. Thanks to the Preston Lib Dems team for this photo from their stall at Preston LGBT Pride - this was the last weekend in September, bringing the Pride season to a close for 2018 along with a similar event in Carlisle. 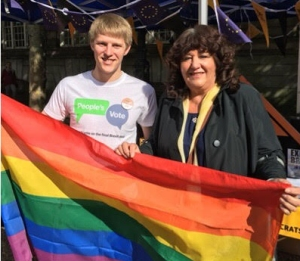 We saw Lib Dems at loads of Prides all across the country this summer including Liverpool, Preston, Bury, Lancaster, Manchester, Levenshulme, Chester and more here in the North West. If you'd like to make sure we are seen at 2019's Prides around the region, perhaps including one near you, you can get in touch with the party's LGBT+ group here. 20 October: Crewe campaigning training day, organised by ALDC. £5/£3 per person. Programme details here. 20 October: London - People's Vote march for a Second Referendum on Brexit. See article above. 26 October: Manchester - Dinner with Wera Hobhouse MP, tickets £35 here. 26 October: Mobberley - Tatton LDs present The North West and the Lib Dems: Past, Present & Future, with speaker Jackie Pearcey. £10: more info here. 8 November: Didsbury - Pakora & Politics, tickets £10. More info here. 10 November - Liverpool - Campaigning training day, similar to Crewe event - details in next edition of Notes & News. 23 November: Longton - South Ribble & West Lancs LDs AGM, guest speaker Tim Farron MP. Longton Sports & Social Club at 7.30pm. 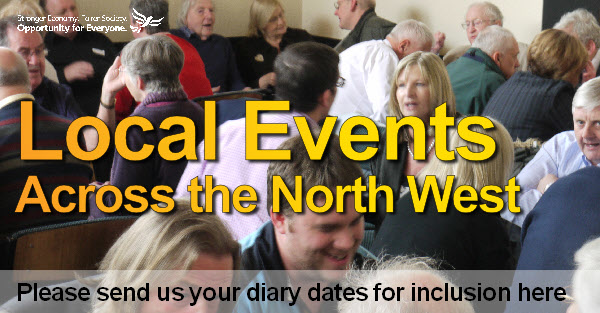 11 January: South Ribble - Event with guest speaker Chris Davies, former NW MEP. Details to follow.